Join us for the 2013 MVP Family Weekend Trip to West Forks, Maine August 8-10. Paddling opportunites on the Dead and Kennebec rivers. We'll have all the rafts, duckies, and other fun club boats there as well. The club as reserved the group site at Webb's (Appleton's RiverDrivers). This weekend has the to get family members out (in a raft or other inflatable) on the river at a moderate flow; to help people stepping up from class 2 to cl 3 out on a river at a level that allows the experienced boater to have a lot of fun and still not be too intimidating for the paddlers stepping up..
We will "organize" ourselves about 8AM (Saturday) at Webb's. We should be departing 9'ish for the river. Anyone wishing to take Webb's shuttle instead of driving should go to Appleton's about 8:30am. Reservations are not needed (cost $18 per canoe/kayak and paddler). Sunday there is an early-morning Kennebec "Fish Flow". Release level is 500cfs (mostly class II/II+ with one class III spot). It's afund run, mostly rock gardens and nice surfing. The gorge is beautiful at that leve. It also allows you to see what causes the bigger features on the river at higher levels.Leaving Webb's at 7am; plan on being shuttled and on the river by 8am. Jump out a the bottom of the gorge to shuttle back up to the put-in for the 10am regular release. We will be based at Three Rivers Campground again and have reserved sites 1 & 2. Each site holds 6 tents. We will need other sites if last year was any indication. The group site will also serve as home base for our weekend activities. If you would like to stay at the group site, please call Three Rivers (1-877-846-7238) and let them know you would like to add to reservation number 2979. This is first come first serve. You are welcome to camp in a different area if you prefer. The phone number for Three Rivers campground is 207-663-210. Please post on the message board if you have a site somewhere and are willing or would like to have others join you. We will post to the message board with the names and telephone numbers of several campsite/cabins in the immediate West Forks area if needed. The Dead release is 2400 on Saturday and 1800 on Sunday. Low enough to not scare new class 2 paddlers wanting to be class 3 paddlers ( at least not too badly), but high enough for the class 3/4 paddlers to have a lot of fun. The Kennebec release is 2400 on Saturday and a minimum release of 4800 on Sunday. This is the MVP, we paddle with anyone and will find a spot for anyone who shows up without a confirmed site. We seldom plan in too much detail. So when I give you an idea of what we might do, keep that last part in mind. Thursday/Friday. If people wish to go up early there are plenty of other paddline opportunities as well including the Penobscot, Kennebec, and many rivers in Quebec (bring a passport). Please post on the Message Board if you're interested in paddling early. 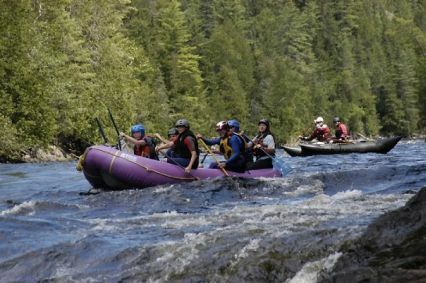 Sunday the Dead will be at 3500 cfs, the Kennebec will flow, and we will likely have groups of rafters, shredders and kayakers headed to both rivers. The Seebomic section of the Penobscot is about 90 minutes away, Fortunately it would add only about 30 to 45 minutes to your drive home if anyone wants to head there instead of the Kennebec or Dead. It may also be an option for friday early birds. Meals are on your own. There are several restaurants in the area. If someone wants to organize a group cookout, please feel free to do so, just coordinate it on the website. If you or your family member does not want to take part in the whitewater activities of the weekend, the Forks offers other great activities including hiking, mountain biking, golf or fly fishing. Please use the MVP message board to communicate if you have questions or comments.